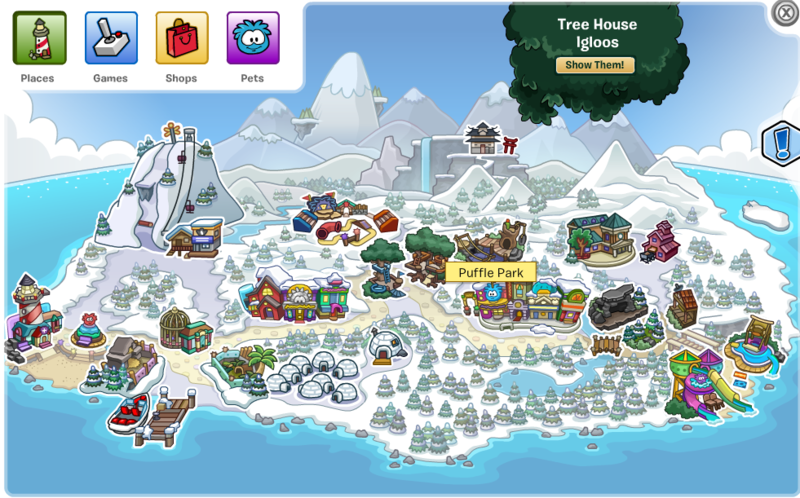 Club Penguin Puffle Party Guide and Cheats April 2014! 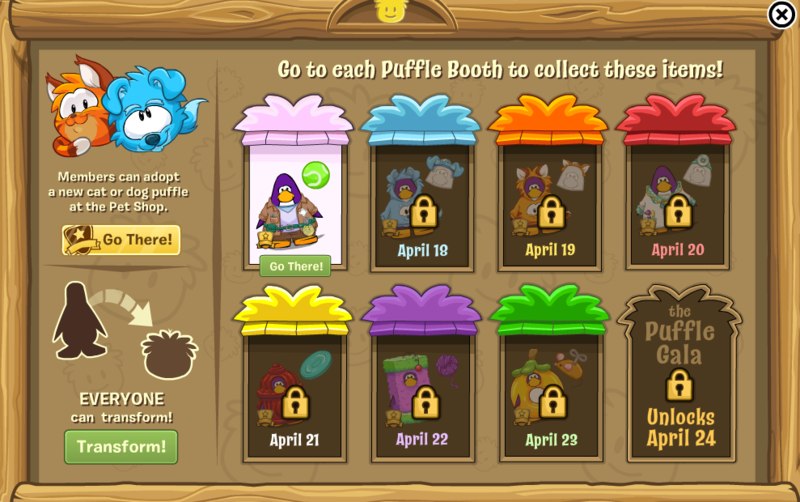 After a long wait for the dog and cat puffles, the Puffle Party for April is finally here! So of course you'll be able to adopt the brand new puffles, the cat and dog puffles. 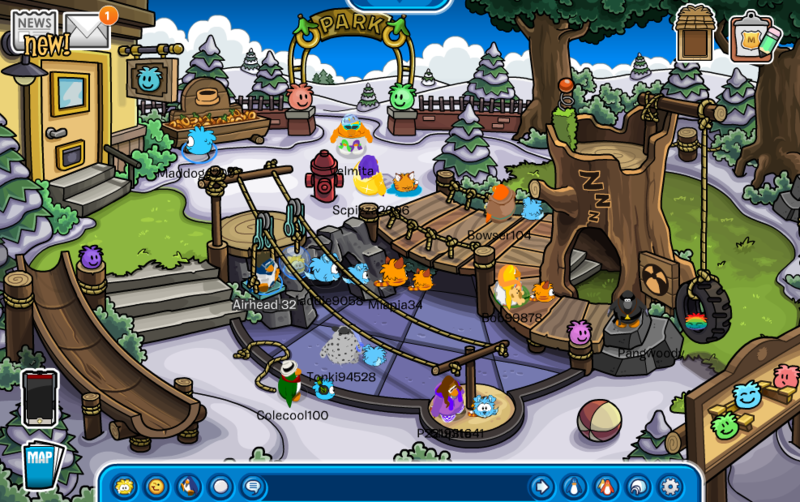 The island is also nicely decorated for the Puffle Party! There's a lot going on at the Plaza! Everyone is walking their pet puffles looking for hidden treasure. You'll notice that the stage was replaced with a new building called The Puffle Gala! It says it'll open on April 24th so we'll have to wait. You'll notice that there is a orange colored booth. You will be using those to get new items through out the days of the party. Come back every day to unlock them and get free items! I'm about to go unlock the first item. Click the button 'Go There' to instantly teleport to the room with the booth. In every booth there's an item for members and one item for everybody. Did you notice this? If you're a member you can adopt the cat and dog puffles. If you're a non-member then do not worry because everyone can transform into a puffle! Club Penguin added some new cool emojis that you can use. I like the bone emoji. Club Penguin also added a new button that allows you to command your puffle to do something. For example, you can click the heart to give your puffle some love. If your puffle finds something you should definately use the heart. Also if you click the big button that has a red money bag on it then you will command your puffle to dig. You can use this button every 1 minute. If you open up your map you will notice many rooms have been decorated temporarily for the party! There's one room that will be staying permanently on the island. Can you guess what it is? You're right, it's the Puffle Park! At the Puffle Park you can hang out and have fun with your puffle. 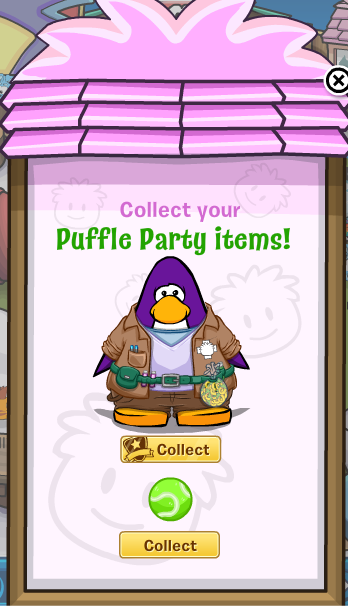 Don't forget that your puffle may find items here at the park!